Deceptive from the main roadside is this superbly appointed three bedroom end terrace property offering versatile living accommodation over three levels and occupying a corner plot. Driveway, garage and attractive rear garden. ACCOMMODATION Deceptive from the main roadside is this superbly appointed three bedroom end terrace property offering versatile living accommodation over three levels and occupying a corner plot position. The accommodation comprises entrance hall, lounge, spacious kitchen diner with staircase leading down to the additional cellar room, first floor landing with access to two bedrooms (bedroom one benefiting from en suite shower room/w.c. and built in wardrobes), house bathroom and a further staircase leads to bedroom two. Outside, to the front of the property there is a concrete driveway providing ample off road parking leading to a single detached garage with power and light, well manicured borders with an array of plants and shrubbery. To the rear there are lawned garden areas, timber patio area, larger than average chicken coop, outdoor storage facility and timber panelled fence surrounds. 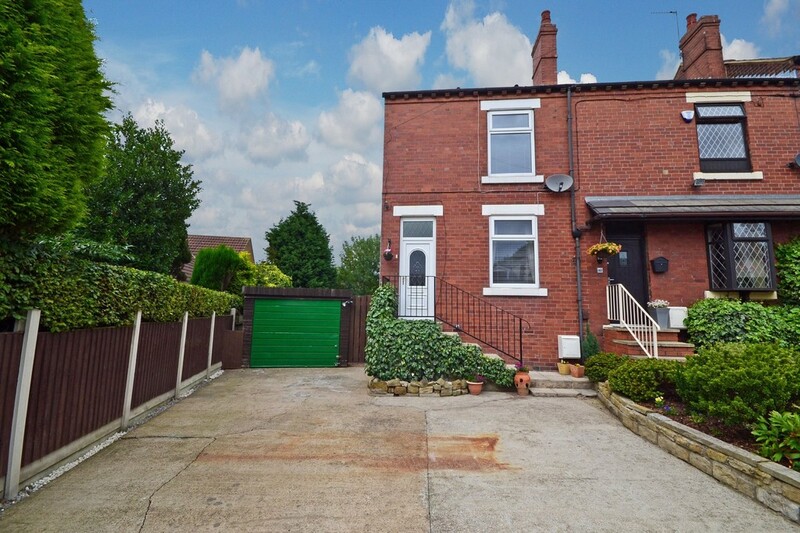 An ideal home for the family or working couple and Wrenthorpe is host to a good range of amenities including shops and schools, whilst, daily access to Leeds and further afield can be had via the M1 motorway, which is only a short distance away. 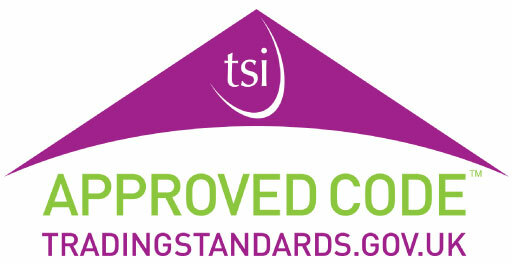 We strongly recommend an internal inspection at your earliest convenience to avoid disappointment. ENTRANCE HALL UPVC double glazed front entrance door with a frosted glass patterned insert with UPVC double glazed frosted sunlight above. Central heating radiator, laminate flooring, coving to the ceiling, inset spotlights to the ceiling, doors to the lounge and kitchen diner. Staircase leading to the first floor landing. KITCHEN DINER 13' 2" x 14' 11" (4.01m x 4.55m) Coving to the ceiling, UPVC double glazed window to the rear, UPVC double glazed window to the side, a range of base units with laminate work surface over, tiled splash back, 1 1/2 sink and drainer with chrome mixer tap, plumbing and drainage for an automatic washing machine, space for a range style cooker inset into the chimney breast with decorative tiled surround. Door to the cloakroom having a staircase leading to the cellar room. Space for freestanding fridge and freezer, central heating radiator, radiator with cover, laminate flooring, UPVC double glazed rear entrance door with frosted glass patterned insert and UPVC double glazed frosted sunlight above. Built in cupboard with shelving to the side. CLOAKROOM solid concrete staircase leading to the cellar room. CELLAR ROOM 13' 3" x 15' 1" (4.04m x 4.6m) UPVC cladding to the ceiling, power and light, central heating radiator. LOUNGE 11' 4" x 13' 2" (3.45m x 4.01m) UPVC double glazed window to the front, coving to the ceiling, ceiling rose, living flame effect gas fire in chrome on a granite hearth with granite matching interior within wooden decorative surround, dado rail, central heating radiator, t.v. point. FIRST FLOOR LANDING Coving to the ceiling, loft access, inset spotlights to the ceiling, doors leading to the storage cupboard housing the boiler, bedrooms and bathroom/w.c. Central heating radiator, glass balustrade, single frosted glazed window to the en suite shower room/w.c. Door with staircase leading to the loft conversion. BEDROOM ONE 10' 1" x 14' 11" (3.07m x 4.55m) Single built in wardrobes to either side of the bed recess with single cupboard over. Inset spotlights to the ceiling, coving to the ceiling, UPVC double glazed window to the front elevation. Built in double wardrobe, single wardrobe, drawers and three cupboards over. Modern fitted wall mounted radiator with mirrored piece in the centre. Built in under stairs storage cupboard. Door to the en suite shower room/w.c. EN SUITE SHOWER ROOM/W.C 5' 9" x 5' 10" (1.75m x 1.78m) Three piece suite comprising enclosed shower cubicle with chrome thermostatic rain shower and separate chrome shower attachment. Low flush w.c., ceramic wash basin built into a Corian work surface with high gloss vanity units built in below, fully tiled walls, shaver socket point, chrome ladder style radiator, UPVC double glazed frosted window to the side elevation, inset spotlights to the ceiling, extractor fan, UPVC cladding to the ceiling. BEDROOM THREE 10' 0" x 8' 2" (3.05m x 2.49m) UPVC double glazed window to the rear elevation, coving to the ceiling, built in wardrobe with sliding mirrored glass doors, central heating radiator. HOUSE BATHROOM/W.C 9' 7" x 5' 11" (2.92m x 1.8m) Modern fitted bathroom suite comprising sunken Spa Jet bath with chrome mixer tap and thermostatic shower over and bi-folding glass shower screen, ceramic wash basin with mixer tap built into a Corian work surface with vanity units below, low flush w.c. Fully tiled walls, fully tiled floor with under floor heating, chrome ladder style radiator, inset spotlights to the ceiling, extractor, UPVC cladding to the ceiling, UPVC double glazed frosted window to the rear elevation. STAIRCASE LEADING TO BEDROOM TWO 11' 3" x 15' 3" (3.43m x 4.65m) UPVC double glazed window to the side elevation, two storage cupboards into the eaves, central heating radiator. OUTISDE To the front of the property there is a concrete driveway providing ample off road parking with raised wood chip borders with an array of plants, trees and shrubs. There is a paved pathway leading to the front entrance door. The driveway leads to the larger than average garage with up and over door, power and light. Gated entrance into the rear garden. The rear garden has a low maintenance pebbled pathway leading to timber decked steps and patio area. Well manicured lawn area and further attractive lawned area with outside storage facility and paved steps.